Ciara Mageean clinched a 1500m victory at Saturday's British Milers Club meeting in Watford. Mageean, 26, clocked 4:09.11 seconds to finish 0.99 seconds ahead of Scotland's European Junior 1500m champion from last year's Jemma Reekie. English athlete Jessica Judd took third place in 4:12.58 as Mageean produced an encouraging run after her 13th place in the event at the Commonwealth Games. Kerry O'Flaherty produced a European Championship B standard in Belgium. 3,000m steeplechaser O'Flaherty, 36, finished third in her event in Oordegem in Belgium as she clocked 9:53.00. Athletics Ireland's A standard for the Berlin championships in August is 9:45.00. 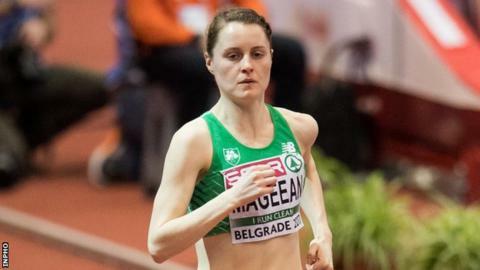 Mageean was almost four seconds inside Athletics Ireland's 1500m standard for the Europeans when she clocked 4:04.49 in Rome last summer while she also achieved the Berlin mark at the Commonwealth Games final last month. Leon Reid's 200m victory helped Birchfield Harriers finish fourth at the European Club Championship event in Birmingham. Northern Ireland's Commonwealth Games bronze medallist clocked 20.85 seconds to finish ahead of Turkey's Jamaican-born 2016 European Championship silver medallist Jak Ali Harvey. Bath-born Reid is hoping to represent Ireland at the European Championships but is waiting to see whether the IAAF grants his international transfer. Beechmount Harrier Davicia Patterson has put herself in line for World Junior Championship selection in July after improving her 400m best to 53.64 seconds at the AAI Games at Santry on Sunday. The 17-year-old's time cut 0.85 second off her previous personal best set last year as she clinched victory at the meeting. Patterson, who represented Northern Ireland at last year's Commonwealth Youth Games in the Bahamas, can now look forward to a trip to Tampere in Finland for the World Juniors. Also at AAI Games, Cork woman Phil Healy clocked a wind-assisted 100m of 11.34 seconds although it was not an Irish record as the wind reading was 2.5 metres per second. The record of 11.40 is jointly held by Amy Foster and Ailish McSweeney.